I thought that I would post a few pictures of things that we have been busy with this holiday season. We had fun decorating the house and had 4 trees. Next year, hopefully I will have more and can do more decorating for the season. There are also other pictures of festive things that we have been doing. Carter is so excited for Christmas this year and it is so much fun. Today we are busy with the finishing Christmas day touches and getting ready to drive to Indiana the day after Christmas to spend a week with my family. Hopefully, the snow that is there now will stay until we get there and even snow some more. so we were able to hang stockings over the fireplace. Carter's Firetruck Christmas tree in his room. We went to the zoo for Lights before Christmas. It is basically just a large light display that you walk through. We decided to go on one of the coldest nights, but had alot of fun. I made a variety of cookies this year, not as many as usual, but Carter got into the action and helped me out. Here he is dipping Oreos. He always has such unique facial expressions. The youth at our church did a Christmas play last weekend, so here is a picture of Carter sitting in front watching the "big" kids talk and sing. He is supposed to be dressed like a little lamb. None of his class sang like they were supposed to, but Carter sat nice and still and absorbed what was going on around him. It was so cute. Sitting on Santa's lap. In the past Carter has been scared to sit on Santa's lap, but not this year. 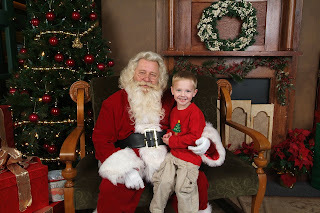 We talked it up big and he was so proud when we went to see Santa. He sat right on his lap and told him what he wanted. 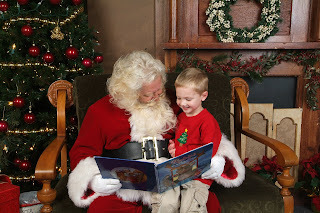 However, when we saw Santa at the zoo the other day, Carter did not want to sit on his lap, because he looked different and he had already told Santa what he wanted. Merry Christmas to everyone. Have a happy and safe holiday season. We have enjoyed receiving many Christmas cards from family and friends and are thankful for all of our blessings. Well, the holiday season is here and we have been very busy. Since Halloween, it seems like the month of November went by in a flash. So now we are onto Christmas. Here are a few pictures of our family tradition to cut down a christmas tree. We went to the same place as the pumpkin patch so Carter refused to say that it was a Christmas Tree farm, just a pumpkin patch with trees. Don't argue with a 3 year old. Here is Carter being the so strong little guy helping Daddy carry the tree..
A quick pose with Mommy. It actually was cold enough to have to wear the hat and mittens. It is not usually like that down here but that day was very windy and about 40 degrees.. No snow or anything like that..
On the baby front, things are going good. I am 28 weeks now and feeling good for the most part. Here is a picture of her nursery. I don't have the walls decorated or things in place, but this is a start. My goal was November and we succeeded. We went to visit a pumpkin patch on Saturday. They have hayrides, pumpkins, a play area and animals. Carter enjoyed all of it but especially liked getting to sit on all of the tractors. Fall weather was in the air and Carter did a little better posing for pictures this year, but we still have some work to do. Our big boy with the pumpkins. Is Carter having a baby brother or baby sister??? Carter had some friends and family over for his 3rd birthday party. He loves firetrucks, so that was our theme. The kids decorated fire truck hats, got fire truck tattoos and made fire truck cookies. They also played with trucks and tractors and all that boy stuff. Carter and his friends with his cake. The kids decorating fire truck cookies. My sweet 3 year old boy. We celebrated Carter's 3rd birthday with a trip to the SC State Fair. It is nothing like good Indiana fairs, but it worked for a 3 year old. This year he got to ride on the rides, which he just loved... We spent the entire day there and then came home and opened a few presents.